Restless legs syndrome in patients with chronic renal failure on hemodialysis: Does peripheral iron status matter? BACKGROUND: Scant information is available on the prevalence of restless legs syndrome (RLS) among patients with chronic kidney disease (CKD) on hemodialysis and its correlation with peripheral iron status. This study was carried out to estimate the prevalence of RLS among patients with chronic renal failure on hemodialysis and to correlate the presence of RLS with peripheral iron status. METHODS: Adults diagnosed with CKD were studied. Demographic details, comorbid illness, and the number of years diagnosed with CKD and on dialysis were noted. RLS was diagnosed based on the International RLS Study Group criteria. Severity of RLS was assessed by international restless legs scale (IRLS) severity score. The presence of RLS was correlated with peripheral iron status. RESULTS: The mean age of 116 subjects was 50.7±13.6 years. Of the total subjects, 79 (68.1%) were men. The mean body mass index of the subjects was 22.02±3.5kg/m2. The subjects had CKD for a mean duration of 3.5±3.2 years and were dialyzed for 2.5±2.3 years. The prevalence of RLS was found to be 10.3% (12/116). Five subjects each had mild and moderate RLS by IRLS severity score and two had severe RLS. All 12 patients with RLS were hypertensive. Hemoglobin and serum ferritin levels were higher in patients with RLS as compared to those who were RLS negative with CKD. CONCLUSION: RLS was previously undiagnosed in this population. Considering RLS, peripheral iron measures are of questionable validity in patients on hemodialysis. Measures to early diagnosis and prompt treatment should be taken, as RLS is known to cause impairment of daytime functioning, disturbed sleep, and increased mortality. Restless legs syndrome (RLS) is a sleep disorder that is poorly recognized in clinical practice. It is a sensorimotor condition with a constellation of symptoms comprising an urge to move the legs, which is usually but not always accompanied by uncomfortable and unpleasant sensations in the legs. The restlessness occurs or worsens at rest, in the evening or night than during the day, and is relieved by activity. These symptoms should not be solely because of another medical or behavioral condition (e.g., myalgia, venous stasis, leg edema, arthritis, leg cramps, positional discomfort, and habitual foot tapping). To date, all the epidemiological studies have reported the prevalence to be between 2.1% and 10% in general population. RLS has been related to several medical conditions, especially uremia, iron deficiency anemia, pregnancy, and neuropathies. Substantial evidence for a genetic contribution to RLS is available. Increasing evidence for the presence of brain iron deficiency in patients with RLS is available. Regional brain iron deficiency in the substantia nigra, putamen, and caudate nuclei contributes to the pathophysiology of RLS. RLS is one of the important sleep disorders observed in patients with chronic renal failure. Prevalence of undiagnosed RLS in patients with CKD on hemodialysis is 10.3%. Peripheral iron status does not correlate with the presence of RLS in patients on hemodialysis. Measures to early diagnosis and treatment of RLS are required in patients with CKD. Evidence for a link in the role of the dopaminergic system and iron status in the pathophysiology of RLS is available.,, Iron is required as a cofactor for the activity of the rate-limiting enzyme, tyrosine hydroxylase, in the production of dopamine. Therefore, iron deficiency may affect dopamine production indirectly, leading to increased dopamine intracranially. Postsynaptic dopaminergic receptor downregulation and reduced internal cellular function result in the symptoms of RLS. Lab markers such as serum iron, transferrin, total iron binding capacity, transferrin saturation, and ferritin can be used to assess the iron deficiency status and to correlate with the presence of RLS. The study by Panda et al. in South India estimated the prevalence of RLS to be 2.9%. A study in our center in 2007 had shown the prevalence of RLS in the community to be 2.1%. In another study by Gupta et al., of 653 subjects with insomnia or leg pain, 15.31% of the subjects had RLS. Female subjects outnumbered male subjects by a ratio of 2:1. Approximately 94% of subjects had a moderate to very severe form of the illness. On conducting a literature search in PubMed, Scopus, and MedIND using key words “restless legs syndrome,” “chronic renal failure,” “chronic kidney disease,” and “India,” two studies on patients of RLS and chronic renal failure (CRF) in India were found., The prevalence of RLS in the subjects studied was reported to be 6.6%. Fifty-six more articles were evident when the search terms “restless legs syndrome,” “chronic kidney disease,” and “chronic renal failure” were used excluding “India” in the last 5 years. This study was carried out to address this deficiency and to add strength to the evidence that RLS is probably as prevalent among the patients with CKD as seen in the aforementioned studies. The primary objective was to estimate the prevalence of RLS among the patients with CKD. The secondary objective was to assess the severity of RLS with international restless legs scale (IRLS) score and to correlate the severity of RLS with serum iron studies. All the consenting patients above 18 years with documented CKD, from August 2015 to November 2015, were taken up for study. All the patients with CKD in the study were undergoing regular hemodialysis. Subjects with medical conditions leading to disturbed sleep at night (such as congestive cardiac failure and asthma) and confounders of RLS (peripheral neuropathy and leg edema) were excluded. The prevalence of RLS was 6.6% in patients with CKD from previous studies in North India. To estimate a 15% prevalence of RLS in patients with CKD, the sample size required to estimate with 80% power and 5% alpha error was calculated as 116 subjects. Study was initiated after obtaining approval from the ethics committee and written informed consent from the patients. Data were collected in a predefined questionnaire consisting of demographics, smoking history, alcohol use, and comorbid illness. The number of years diagnosed with CKD, other medical diagnosis, if the patient is on dialysis, and the number of years on dialysis were also noted. A patient was diagnosed with RLS according to the International RLS Study Group when they fulfilled the five essential criteria for the diagnosis of RLS. Family history of any relatives with RLS symptoms was noted as genetic transmission is known. The patients diagnosed with RLS were administered the IRLS severity score questionnaire. Biochemical and lab values such as serum ferritin, serum iron, total iron binding capacity, serum albumin, calcium, phosphate, and alkaline phosphatase were collected. Data were analyzed using the SPSS version 17 (SPSS Inc, Chicago, IL,USA). Descriptive statistics were used for categorical variables describing demographics. Comparison between the patients who were RLS positive and RLS negative was carried out using Student’s t-test for continuous variables and Fisher’s exact test and chi-square test for discrete variables. The presence of RLS with the varying levels of serum iron, serum ferritin, total iron binding capacity, percentage iron saturation, serum albumin, serum calcium, and serum alkaline phosphatase was analyzed by regression analysis. A total of 123 patients with CKD were studied. The mean age was 50.7±13.6 years and 79 (68.1%) patients were men. The mean body mass index (BMI) of the study population was 22.02±3.5kg/m2. The mean number of years diagnosed with CKD was 3.5±3.2 years, and the patients were on hemodialysis for 2.5±2.3 years. Four patients with diabetic peripheral neuropathy and three patients symptomatic because of leg edema (recently initiated on hemodialysis) were excluded from the study. RLS was diagnosed in 12 of 116 (10.34%) patients. Eleven (91.67%) patients with RLS were men. 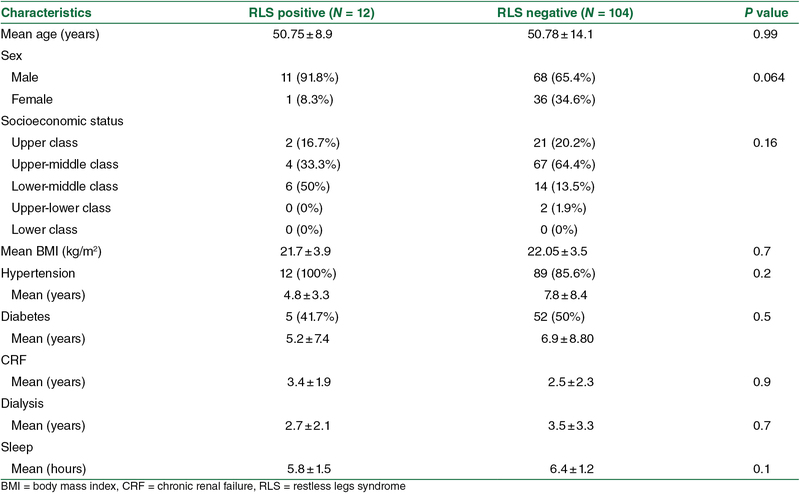 The characteristics of patients diagnosed with RLS were compared with those who were negative for RLS symptoms (control group) [Table 1]. The distribution of socioeconomic status, BMI, smoking history, alcohol use, and comorbid conditions such as diabetes and hypertension were similar in both the groups. All the patients diagnosed with RLS were hypertensive. Though the number of hours of sleep was less in the RLS-positive group, it was not statistically significant (5.8 vs. 6.4h). The patients who were RLS positive were diagnosed with CKD for a longer duration and were on dialysis for a shorter duration as compared with those in the control group. None of the biochemical parameters, such as total iron binding capacity, percentage iron saturation, serum albumin, serum calcium, and serum alkaline phosphatase, were correlated with the presence of RLS on conducting a regression analysis [Table 2]. The patients with RLS had higher values of serum ferritin and hemoglobin. Five subjects each had mild and moderate RLS by IRLS severity score and two had severe RLS. CKD is an increasing public health issue with global prevalence estimated to be 8%–16%. CKD is ranked as 18th in the list of causes of total number of global deaths in 2010. The prevalence of CKD, Stage 3, in India is 6.3%. Insomnia, RLS, obstructive sleep apnea, and excessive daytime sleepiness are some of the sleep disorders noted to occur in patients with CKD. RLS results in poor sleep quality and affects the overall quality of life in these patients. RLS has been associated with new cardiovascular events and mortality in patients with CKD., RLS is many times unrecognized in this population. Early identification and treatment would help to prevent morbidity because of RLS and mortality in these patients. Araujo et al. and Bastos et al. from Brazil had reported a higher prevalence of RLS (21.5% and 48%, respectively) in patients with end-stage renal disease (ESRD)., The study population reported by Araujo et al. comprised the whole spectrum of patients with ESRD including those before hemodialysis. The gender distribution of male-to-female was 11:1 in our study, similar to other studies, which was 9:1 but contrasted with the Brazilian study and study by Calvino et al., where RLS was more prevalent in female patients with CRF. Male predominance of RLS may be due to the fact that the study population comprised majority of male subjects. All the patients in this study were on hemodialysis. Though all the12 patients with RLS were hypertensive, they were not statistically significant. None of the patients had reported any family members having RLS symptoms. This is in contrast to the 16% prior RLS and family history of RLS in a study reported by Araujo et al. There is a fundamental misunderstanding about the relation of peripheral iron status and RLS. Patients with RLS who do not have iron-deficiency anemia have peripheral iron status that is both generally normal and in most studies not significantly different from those without RLS. This was emphasized in the very early work by Earley et al., showing decreased central nervous system iron status in RLS. Even for patients with iron-deficiency anemia, the peripheral iron status generally does not differ significantly between those with and without RLS. Peripheral iron deficiency is significant for the identification of those with RLS secondary to peripheral iron deficiency. Normal peripheral iron levels do not indicate RLS in this CKD population, which is probably related to abnormal brain iron status. Indeed intravenous iron treatment in a blinded study reversed the RLS symptoms in patients on dialysis, indicating a brain iron problem in this population despite high serum ferritin. Hemoglobin and serum ferritin values were significantly higher in patients with RLS in comparison to those in the control group in our study. Serum ferritin elevation by itself does not translate into higher iron stores as the other iron parameters are not significantly different between the two groups. Patients diagnosed with RLS had higher peripheral iron status, which can be attributed to the iron supplements that the patients with CKD received regularly. This highlights the fact that peripheral iron measures are of questionable validity in the patients on dialysis, who have multiple indications of inflammatory processes and are generally treated with iron and erythropoietin. The strength of our study lies in its prospective design and adequate sample size to achieve 80% statistical power. Limitation of this study was that polysomnography or the “suggested immobilization test” could not be performed to further evaluate the RLS. Although all patients were documented to have received iron supplements and erythropoietin, it was not quantified in this study. The prevalence of RLS is 10.3% in the subjects with CRF who are undergoing hemodialysis. RLS was undiagnosed in this population before this study. Considering RLS in patients with CKD, peripheral iron measures are of questionable validity in patients on hemodialysis. Prudent measures to improve the quality of life by early diagnosis and prompt treatment are needed. Allen RP, Picchietti DL, Garcia-Borreguero D, Ondo WG, Walters AS, Winkelman JW, et al. Restless legs syndrome/Willis-Ekbom disease diagnostic criteria: Updated International Restless Legs Syndrome Study Group (IRLSSG) consensus criteria—History, rationale, description, and significance. Sleep Med 2014;1:860-73. Rangarajan S, Rangarajan S, D’Souza GA. Restless legs syndrome in an Indian urban population. Sleep Med 2007;1:88-93. Yee B, Killick R, Wong K. Restless legs syndrome. Aust Fam Physician 2009;1:296-300. Schormair B, Plag J, Kaffe M, Gross N, Czamara D, Samtleben W, et al. MEIS1 and BTBD9: Genetic association with restless leg syndrome in end stage renal disease. J Med Genet 2011;1:462-6. Allen RP. Restless leg syndrome/Willis-Ekbom disease pathophysiology. Sleep Med Clin 2015;1:207-14, xi. Allen RP, Earley CJ. Restless legs syndrome: A review of clinical and pathophysiologic features. J Clin Neurophysiol 2001;1:128-47. Earley CJ, Kuwabara H, Wong DF, Gamaldo C, Salas R, Brasic J, et al. The dopamine transporter is decreased in the striatum of subjects with restless legs syndrome. Sleep 2011;1:341-7. Connor JR, Wang XS, Allen RP, Beard JL, Wiesinger JA, Felt BT, et al. Altered dopaminergic profile in the putamen and substantia nigra in restless leg syndrome. Brain 2009;1:2403-12.
Cooper JR, Bloom FE, Roth RH. The biochemical basis of neuropharmacology. New York: Oxford University Press; 1991. Rangarajan S, D’Souza GA. Restless legs syndrome in Indian patients having iron deficiency anemia in a tertiary care hospital. Sleep Med 2007;1:247-51. Panda S, Taly AB, Sinha S, Gururaj G, Girish N, Nagaraja D. Sleep-related disorders among a healthy population in South India. Neurol India 2012;1:68-74. Gupta R, Lahan V, Goel D. Restless legs syndrome: A common disorder, but rarely diagnosed and barely treated—An Indian experience. Sleep Med 2012;1:838-41. Walker S, Fine A, Kryger MH. Sleep complaints are common in a dialysis unit. Am J Kidney Dis 1995;1:751-6. Calvino J, Cigarran S, Lopez LM, Martinez A, Sobrido MJ. Restless legs syndrome in non-dialysis renal patients: Is it really that common? J Clin Sleep Med 2014;1:57-60. Salman SM. Restless legs syndrome in patients on hemodialysis. Saudi J Kidney Dis Transpl 2011;1:368-72. Bhowmik D, Bhatia M, Gupta S, Agarwal SK, Tiwari SC, Dash SC. Restless legs syndrome in hemodialysis patients in India: A case controlled study. Sleep Med 2003;1:143-6. Bhowmik D, Bhatia M, Tiwari S, Mahajan S, Gupta S, Agarwal SK, et al. Low prevalence of restless legs syndrome in patients with advanced chronic renal failure in the Indian population: A case controlled study. Ren Fail 2004;1:69-72. Jha V, Garcia-Garcia G, Iseki K, Li Z, Naicker S, Plattner B, et al. Chronic kidney disease: Global dimension and perspectives. Lancet 2013;1:260-72. Varma PP. Prevalence of chronic kidney disease in India—Where are we heading. Indian J Nephrol 2015;1:133-5. La Manna G, Pizza F, Persici E, Baraldi O, Comai G, Cappuccilli ML, et al. Restless legs syndrome enhances cardiovascular risk and mortality in patients with end-stage kidney disease undergoing long-term haemodialysis treatment. Nephrol Dial Transplant 2011;1:1976-83. Aritake-Okada S, Nakao T, Komada Y, Asaoka S, Sakuta K, Esaki S, et al. Prevalence and clinical characteristics of restless legs syndrome in chronic kidney disease patients. Sleep Med 2011;1:1031-3. Araujo SM, de Bruin VM, Nepomuceno LA, Maximo ML, Daher Ede F, Correia Ferrer DP, et al. Restless legs syndrome in end-stage renal disease: Clinical characteristics and associated comorbidities. Sleep Med 2010;1:785-90. Bastos JP, Sousa RB, Nepomuceno LA, Gutierrez-Adrianzen OA, Bruin PF, Araújo ML, et al. Sleep disturbances in patients on maintenance hemodialysis: Role of dialysis shift. Rev Assoc Med Bras (1992) 2007;1:492-6. Earley CJ, Allen RP, Beard JL, Connor JR. Insight into the pathophysiology of restless legs syndrome. J Neurosci Res 2000;1:623-8. Allen RP, Auerbach S, Bahrain H, Auerbach M, Earley CJ. The prevalence and impact of restless legs syndrome on patients with iron deficiency anemia. Am J Hematol 2013;1:261-4. Sloand JA, Shelly MA, Feigin A, Bernstein P, Monk RD. A double-blind, placebo-controlled trial of intravenous iron dextran therapy in patients with ESRD and restless legs syndrome. Am J Kidney Dis 2004;1:663-70.